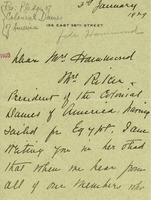 Mrs. Franis writes to Mrs. Hammond about the delay of her Colonial Dames of America chapter's donation. 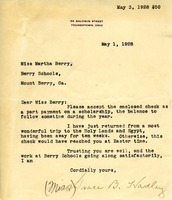 Letter to Martha Berry from Grace B. Hadley informing Miss Berry that she has enclosed a check for part of the payment on her scholarship. She also informs Miss Berry that she has been to the Holy Lands and Egypt but that otherwise the check she should have received the check around Easter. She also expresses her hope that Miss Berry is doing well and that the schools are continuing to go along satisfactorily.